Over the last few years Oliver Schories has been refining a warm and delicate style of crossover house and techno, accruing a collection of dance material for labels such as Kollektiv Turmstrasse’s Musik Gewinnt Freunde, Ostwind and Parquet Recordings. On ‘Herzensangelegenheit’, his debut album delivered back in March last year, Schories struck a balance between poignant pop and deeply groovy club work through a melange of soulful vocals, melodic arrangements and engrossing organic rhythms that once more imbue ‘Exit’, its follow up. Like ‘Herzensangelegenheit’, ‘Exit’ transcends both listening and club contexts to present more luscious, heavy-eyed and hypnotic electronica. 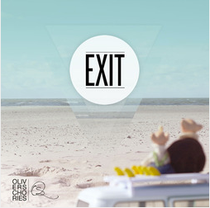 Lashed together with signature Oliver Schories tropes, ‘Exit’ languorously courses between late night house, punchy peak times and blissful reprieves. Lyrical keys and strings, hazy pads and swollen atmospheric timbres form the album’s pillowy base, whilst soft and subtle beatwork keep ‘Exit’ ticking over with poise. From the poppy tones of ‘All I See’, ‘Like You’ and ‘Be’ to the album’s more sentimental floor-facing moments like ‘Sunset’, ‘Get Me’ and ‘Go’, they’re tracks that should stay with you after the album ends. It’s out March 15.